I attended a brilliant life drawing workshop with John Dobbs on saturday at Heatherley's Art School. John is interested in capturing the essence of the subject . You can see his work here: http://www.johndobbs.net . 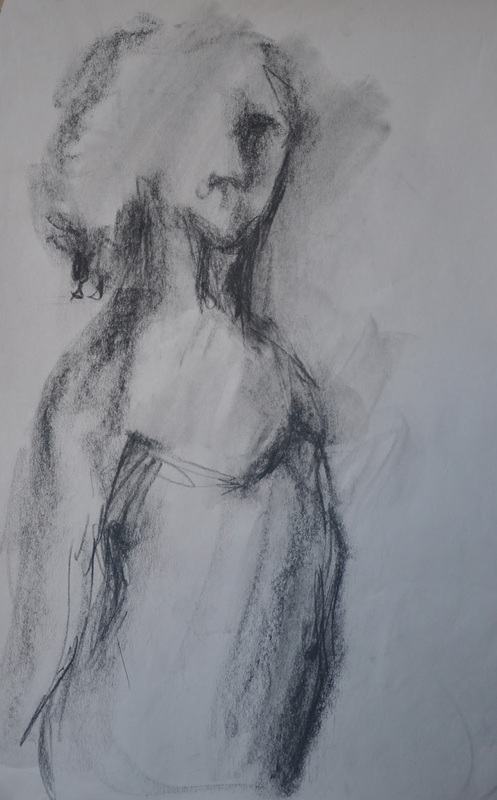 The day began with a series of really quick sketches (1 minute timed) where we tried to work intuitively to find a way to indicate what the key element in the subject and pose were. 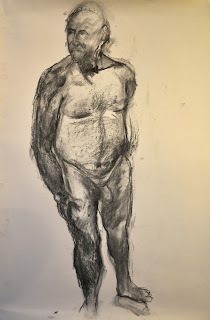 Richard held a rope, crouched, stretched and I used scrap paper and a stick of vine charcoal to indicate direction. weight, light. John showed us some of the artists he thinks do what he is interested in best including Park, Lobdell, William Theophilus Brown, Rembrant - there were about ten. John wasn't so interested in whether the drawing was accurate but more whether we could say something about the subject that was meaningful. 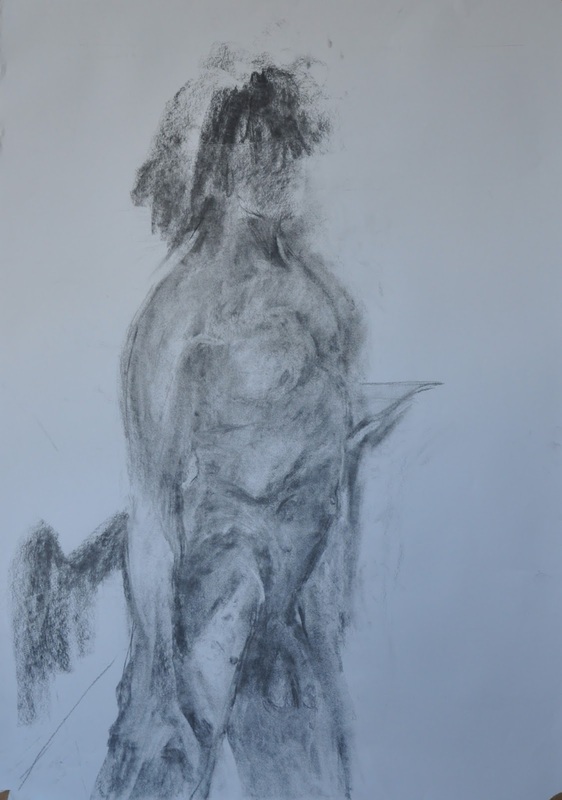 He had us do an exercise that I won't share as I think doing it is the important thing but it helped me to experience the difference between 'copying' and 'observational drawing'. 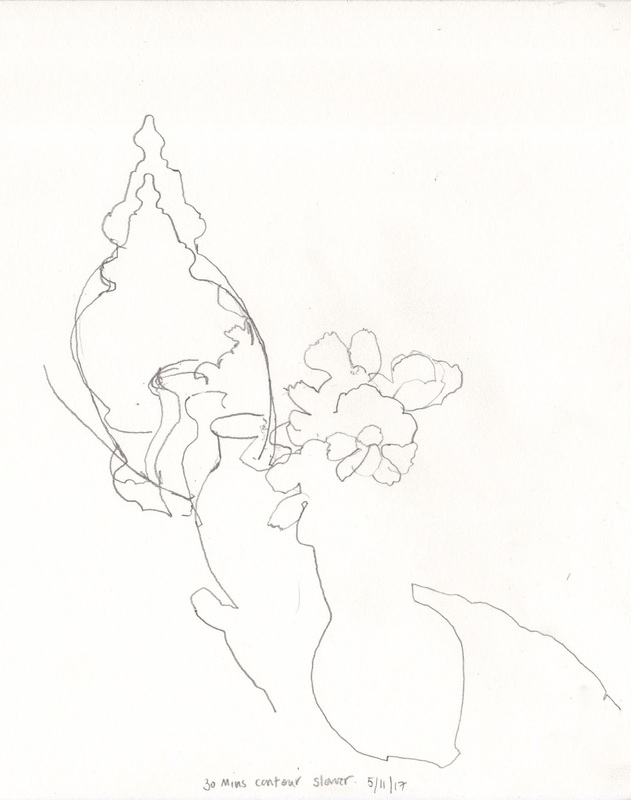 The above drawing was the penultimate and longer than anything previously, nearly an hour. My goal was to get Richard to READ THE BOOK and to show the mood through his posture. I like the pieces of the drawings below as I believe them too. 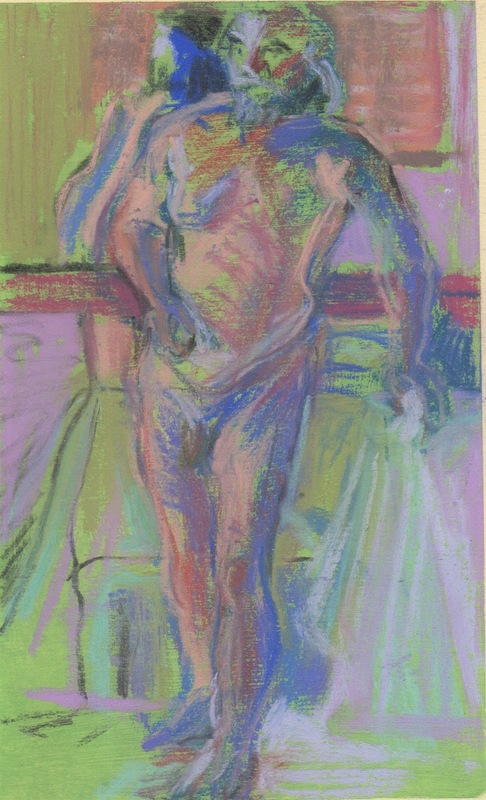 At Sudbury life drawing I decided I needed a colour fix so only used pastel for the two hours. What I wanted to address was combining light and colour more effectively. One of the stand out messages in the workshops has been YOU NEED MORE DARKS. The last drawing, the one at the top may be more effective although Pete's left thigh doesn't do what it should. I like the gesture of the three last drawings. 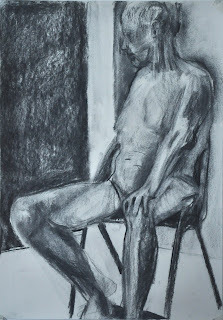 I was still a little sick when I wen to my last NEAC drawing school session with Mick Kirkbride on the 24th of November. It had been a long day with visits to the Modigliani and lunch at the RSA with some family friends and Patrick. It's interesting that with a big piece of paper and an hour, I run out of time now. It's a case of constantly adjusting. I know I need to look more, though. And Carol Webb invited me back to a daytime portrait session. She's had models who can only sit in the evening this term. David Stone, an artist: http://davidstone-art.co.uk, sat for us for a few hours last Wednesday. I had planned to paint but in the mad rush from refugees and school meeting I forgot half my supplies so drew instead. It's been a week of exhibitions with the latest in Bermondsey, London. Not so long ago I responded to an open call for The Concept Space's Winter Salon. 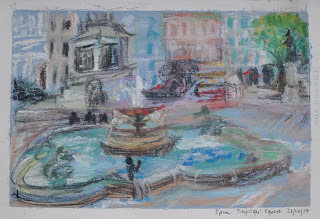 http://www.theconceptspace.org/?exhibition=winter-salon-power-play and was delighted to be selected. 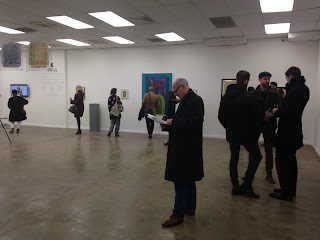 It was the private view on Tuesday so Patrick and I travelled down, arriving first! I had bought advance tickets and for some reason our return ticket was 8:30, so we stayed for an hour and a half but missed KB Stowe's little talk and the performance art. https://www.instagram.com/tconceptspace1/ I met lots of people, including Robert Fitzmaurice whose work was between my two pieces. It was remarkable how well the hang worked. 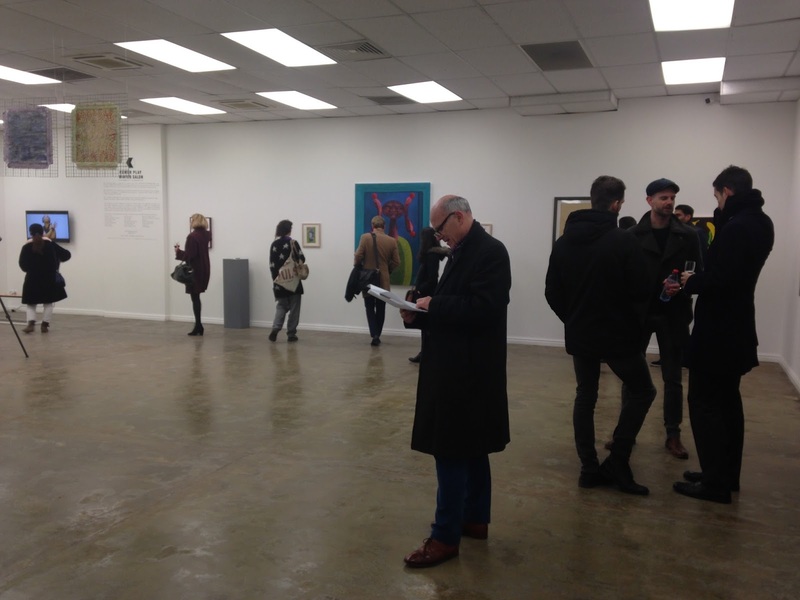 The weekend before, was the Heart of Suffolk Winter Exhibition. We didn't know it but the Bury Free Press did a write up and chose my drawing to showcase. There were a seasdy stream of visitors and as well as each artist selling something, we raised almost £700 for Suffolk Artlink with our raffle and pop up cafe. The miniprint exhibition was in Halesworth over the weekend, but I wasn't able to visit it this time. 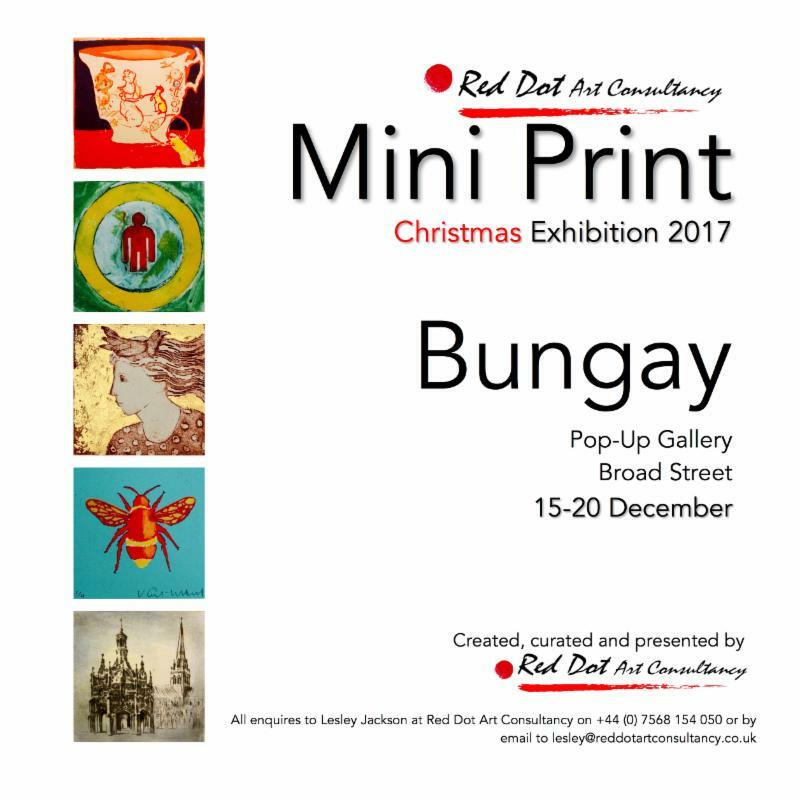 Lesley has found a venue in Bungay, so there is one more chance to see the work before the spring. The private view will be 6pm on the 15th. 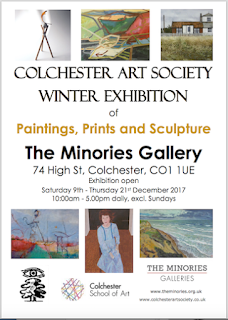 But before the Miniprint, it's Colchester Art Society's Winter Exhibition at the Minories. I hope I have some work in that (not sure yet) but will be going along to the PV tomorrow (6pm) anyway. We couldn't have had more different models over the past two sessions and my approach to drawing them was quite different too. Andrew struck a standing pose and we all wondered if he could hold it for the hour. He was defiant and turned out to manage it with ease. I only noticed his thumb moving back and forth, which I assume was a coping strategy for what must have needed intense concentration. I wish I knew anatomy as Andrew was an anatomical study, for sure. Andrew's second pose was kneeling but the structure of what I saw and drew of his position was similar without being exactly the same. I was looking down on him a little bit in the second pose. What was fun about drawing Andrew was that he had so much attitude and it was that I wanted to hone in on. Lillias couldn't have been more natural. 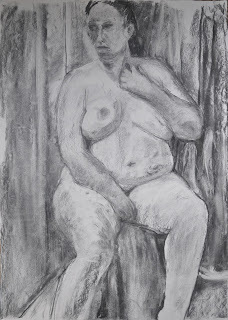 Paul was painting a portrait so she stayed in the pose for the whole 1 hr 45 mins. As I look at it, I think that if I'd had time to really look (which is what I should be doing during the tea break) I would have realised that defining the room probably gets in the way of our interaction with the subject. Lillias had some bright light on her cheek that I failed to carve adequately as well. I intended to move around and do a series of drawings but it's so easy to get carried away. It took me a long time to get going today. 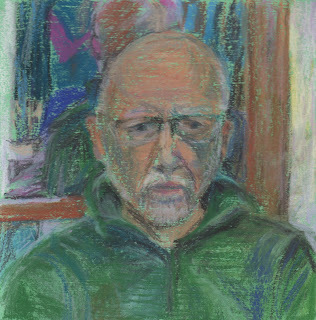 I didn't have any success in the pastel society this year and when I was thinking about it, I mused that they don't like flowers. Of course, we don't paint to to be selected, bought or even cheered on, but it did go through my head that maybe I need another muse. Hey ho, instead of doing something as controversial as that… I decided to take a pearl of wisdom from Louise Balaam and USE MORE PAINT. In fact not only did I think about Louise's words, I also thought about Julie Jackson and her playfulness with the materiality of paint, Alex Fowler and his blocks of just the right colour as I began and sustained this painting today. I would still be painting but it was so dark without articfical light at three that I had to abandon it. 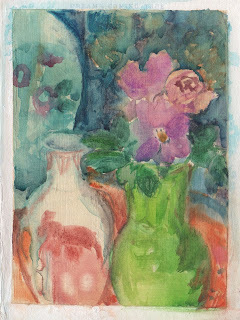 Not only is there a very dark shadow on the white vase, I can't see the colours I'm mixing. annoyingly, I'm not sure when I will be able to return to this. 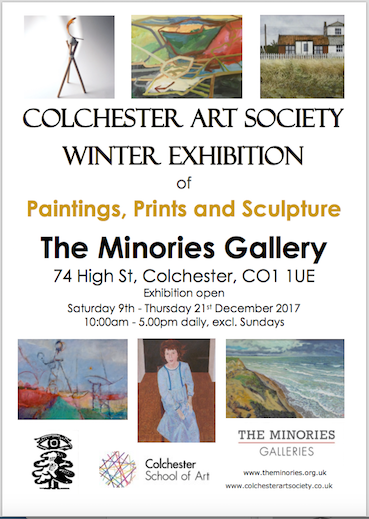 In London tomorrow, at a Colchester Art Society Lunch Saturday and then the inevitable massive clean-up that precedes a visit from friends coming all the way from America. 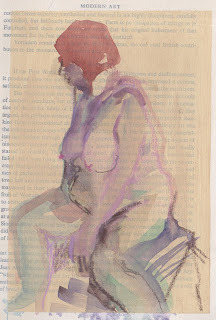 What about watercolour life drawings in an altered sketchbook? Doreen is a special model, utterly natural. 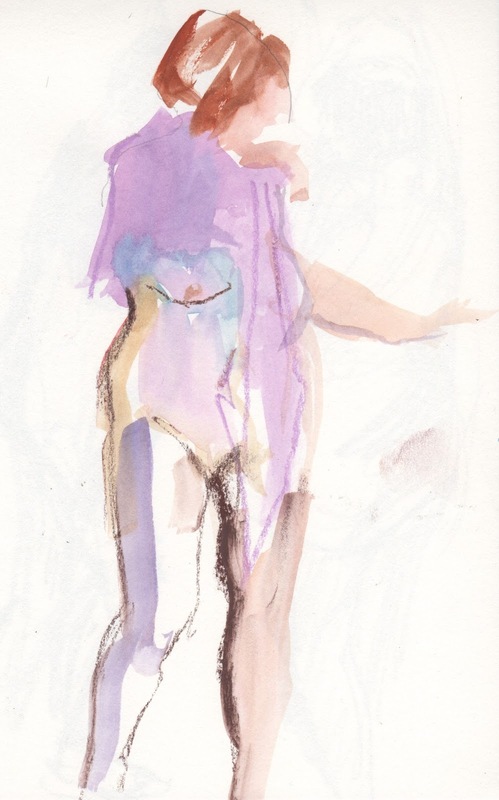 Today she moved around the room slowly with her lavender piece of organza for the first fifteen minutes. 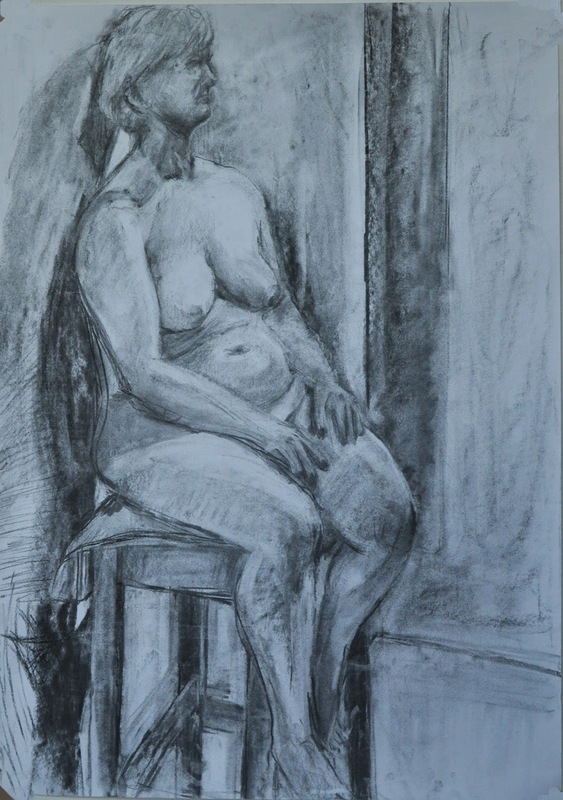 I mostly made a contour drawing as she moved - which was confusing. Doing that got my eye in, though, so when we had ten minute poses, I was primed to look with care. I have never mixed watercolour with pastel before and today it just sort of happened. 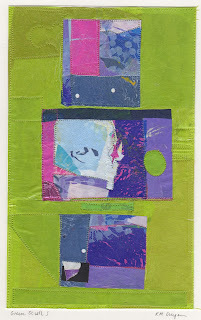 For one thing, I forgot the pad I had prepared so ended up doing different things to what I had imagined. I forgot my kitchen roll so every mark needed to work. Some of the drawings/paintings are on cartridge paper, others are in two of my altered sketchbooks. 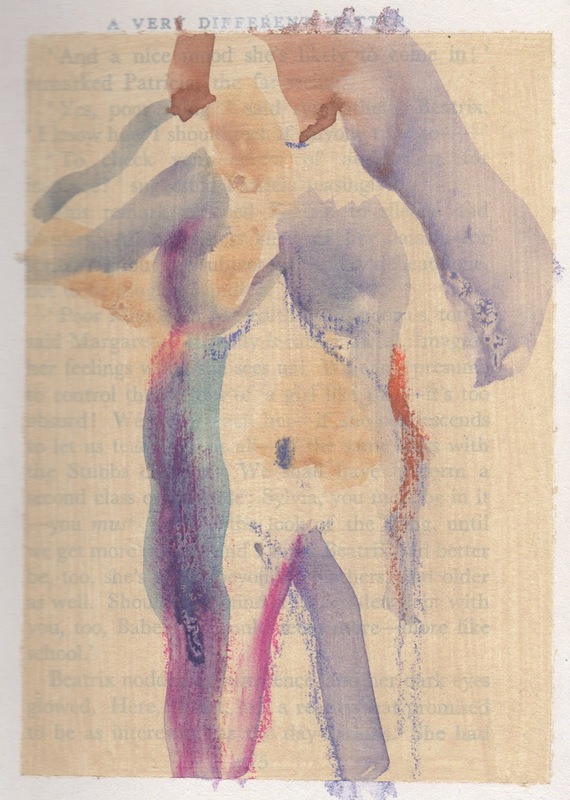 The tan pages are watercolour ground over book pages. 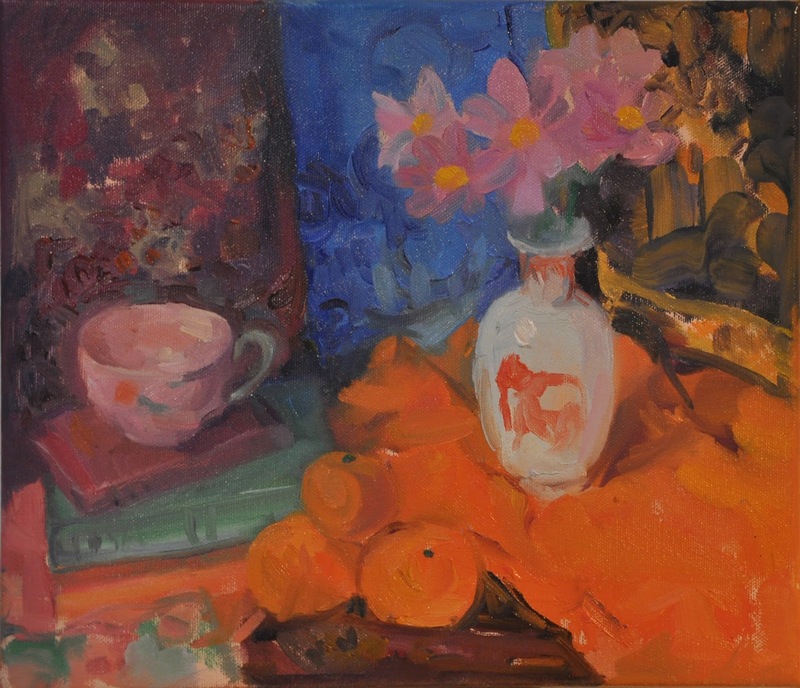 The orangey is a pastel ground. 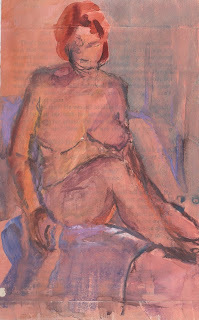 I drew in the wet watercolour with the pastel. It was all fun. 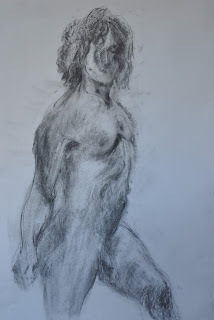 Last week I went to Alex Fowler's Tuesday class at Chelsea Wharf. I was a little late arriving because it is very far from Stowmarket to Chelsea Wharf and there is always a hold-up on one of the trains or the tube. When I visited Alex in his studio a few weeks before, he talked about not naming parts of my drawings and about his approach to working. We talked a lot about colour. I was intrigued and in the spirit of the NEAC scholarship, signed up. The space is fabulous and Alex has a good group of people on Tuesdays. I slotted in to the third and last session of painting this model, although others painted the view out the window, and set up still lifes to work from too. 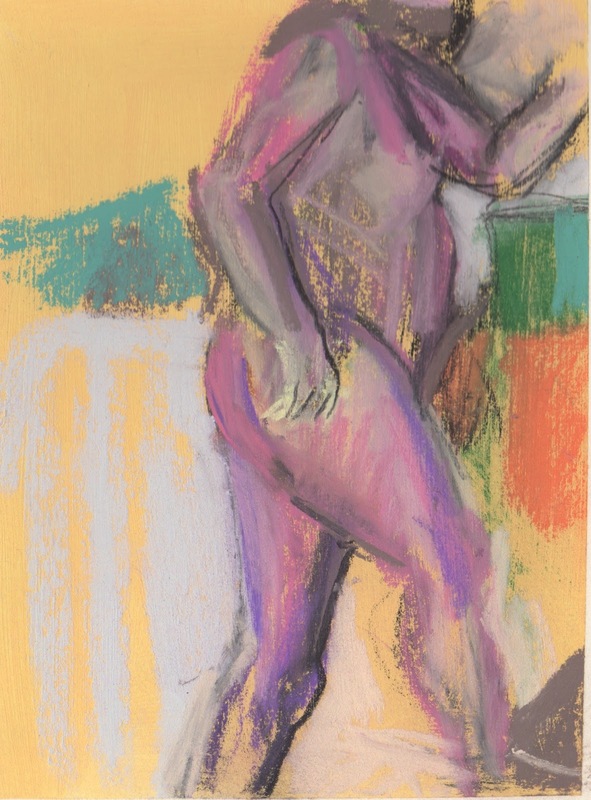 I was on the darker side of the model and as the day wore on it became darker and darker, so dark that I really couldn't see what colour I was mixing at the end. As a result, the trajectory of my painting went from excited passages to a struggle between too dark and not dark enough and it changed in colour. At about 2pm, it was quite muddy but Alex was great at giving me a suggestion and I think I found a way to show the light. I wasn't so successful at adopting Alex' way of working in terms of blocks of colour, though. At the start I thought I knew what he meant but later when I saw him painting I realised he was talking about much bigger blocks of colour than I had imagined. 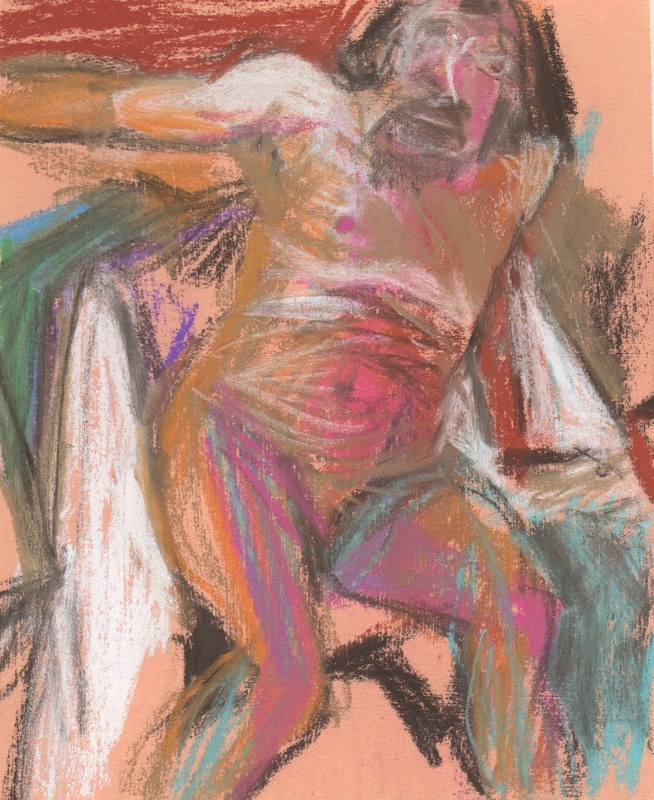 He blocks in the big areas of colour and then works to the more specific, finding that sweet spot between too much and not enough information. He feels that correct colour says almost enough about a subject to describe it. The colour he saw was much brighter and more high key than the colour I saw. Perhaps when we talk about painting the colour we see we are talking about different things? So my painting has a few places where I like the painting, but mostly just feels boring and descriptive to me. I don't feel I have got into the emotion of the situation nor created an interplay of light dark and brushtrokes that is particulalry exciting or original . It's tempting to do the same thing and perhaps repeat the same errors. 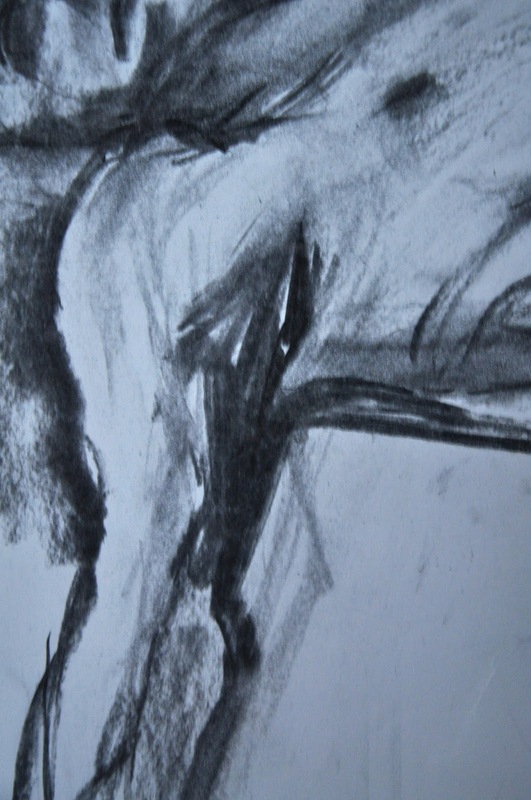 I guess one of the questions the NEAC drawing scholarship has made me think about is what assumptions do I bring to my drawing that are interfering with my observation? I am learning (anew) to look critically at what I am doing in order to do it better the next time. 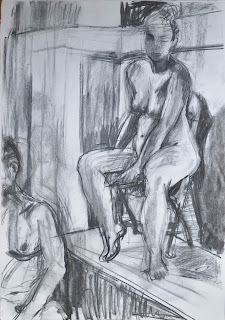 Sometimes, maybe even often, I return from one of my life drawing classes, a workshop or a studio visit feeling quite inadequate. In a way I also feel like a performing seal who hasn't learned the routine. But, of course what I don't want to do is to perform. What I do want to do is learn and progress. 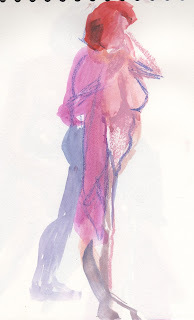 One of my big 'fails' has been the three watercolour workshops I have taken part in. The teaching was good but I didn't have the time and head space, at the time to test things in a way that was relevant to me. I was trying to think like the teacher, because that seems to me to be the best way of getting the most out of a workshop. 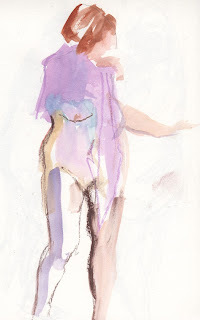 As a beginner with watercolour, I knew after the workshops that I would need to do a lot more of it later - until now I haven't had that elusive time. I have been thinking about things though, and in preparation for my exploration, I bought something that I learned about from Rebecca (life drawing) called 'watercolour ground' to paint on surfaces so the watercolour adheres in a similar way to watercolour paper. 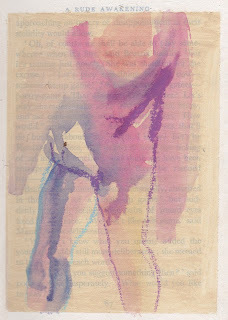 While at Great Art in London one day, I found some Daniel Smith Watercolor Ground. There were other varieties, but the one I bought was on sale and in a smallish tub, so afordable. There wasn't any white, though, so I bought buff titanium. I painted that on a gessoed book page in my ongoing altered sketchbook, A Bold Venture. 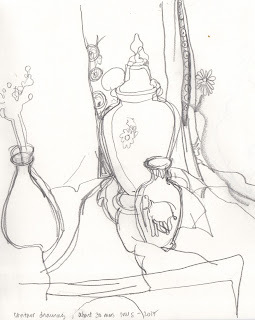 Before beginning a watercolour, I began another project I have been wanting to start. 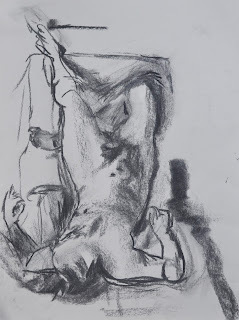 My friend and mentor, Jack Heliker told me (when I had graduated from Stanford) that I should read Kimon Nicolaïdes' book The Natural Way to Draw, and complete all the exercises. 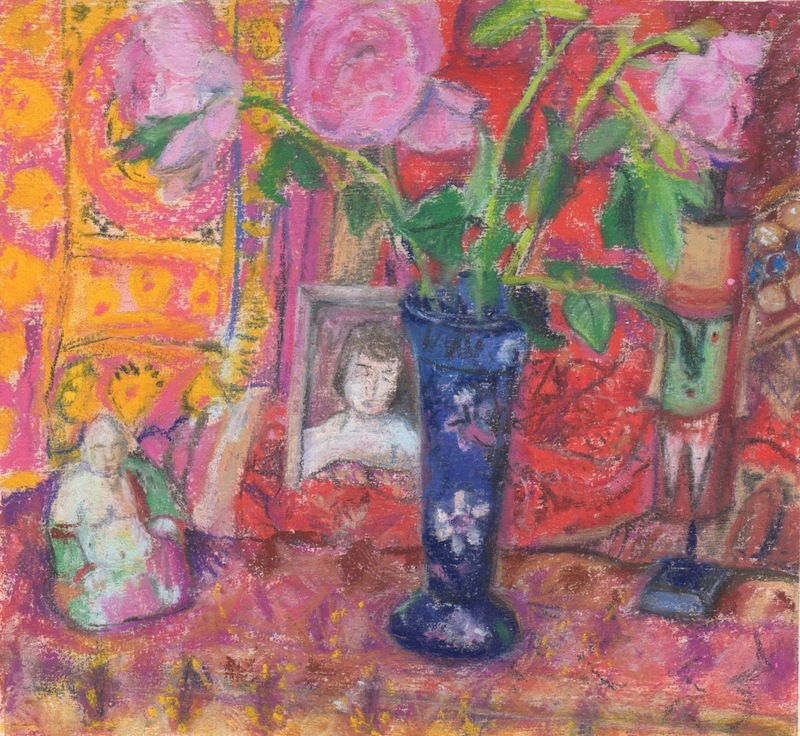 Heliker and Nicolaïdes had both taught at the Art Students' League. In New York, I worked my way through some of the book. Recently, I decided that alongside my current Drawing School learning, going back to Nicolaïdes would be a good discipline. 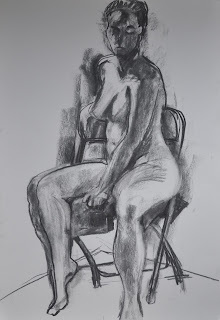 The rules for the first session (3hrs total, of which I did 1 hour) were that you needed to not look at your paper, to draw the contour with a very sharp 3B pencil and to work on a piece of manila paper 15 x 20 inches. I couldn't find a 3B, so used a 4B and used a pink pig sketchbook, standing at an easel. Beause I don't hold my pencil properly, my hand got very tired. My brain got very tired and in the first drawing I looked at my paper to find a place to start quite a few times. In the second drawing, below, my drawing became smaller and smaller, but I really tried to feel the contours. After really looking for that hour, I moved over to the watercolour experiment. I explored the techniques Neil had shown us. My book was on an easel, so it dripped, but I used paper towels and Q-tips to mop up. Lots ot think about… quite a challenge! Whoop, Whoop, I finally have had a little time again and my studio and house are pretty clean and tidy. The annual deadline for the Pastel Society has passed and that means I can turn my attention to the other media that I work in and although I am itching to paint, I wanted to explore an idea that's been buzzing in my head that I thought might be interesting. There is an open submission coming up that it might work for. By titling these I have given you an in into what is in my head. 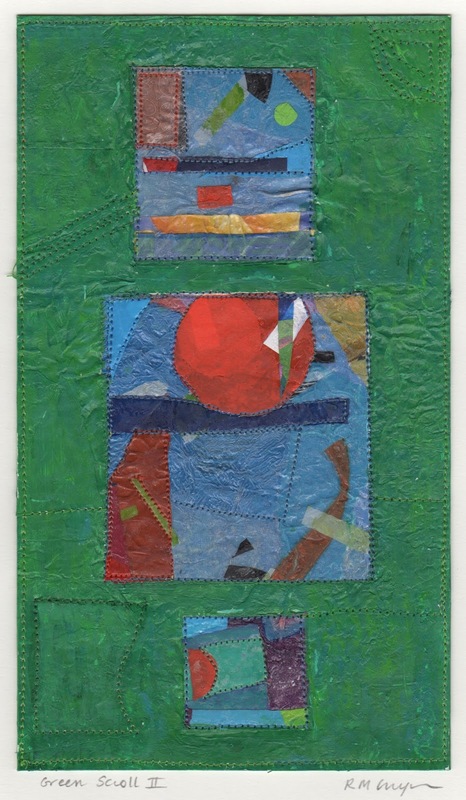 I didn't tell Patrick anything but showed him the top fused plastic collage and asked him for three words. He looked worried, but when pressed, his first word was 'Chinese'. I was so delighted by his first word that he never gave me the other two words. As I worked on the 'Green Scroll' over a few days, I began to feel something Asian in it. I wanted to play with the power of different colours in the arrangement. I was thinking about my night light drawing. The medallions are landscapes and may tell stories. 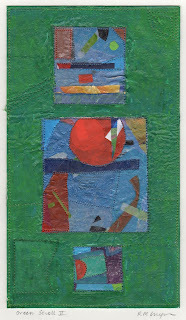 Green Scroll II was even more difficult to realize. I wanted a companion piece and as I worked in a similar way, the plastic melted differently, my shapes shrunk and contorted and when I finished working yesterday it was a mess. The background colour began as yellow then became whites and finally today I masked the medallions with tape and painted in tones of blue and green acrylic paint to float the focal plastic shapes. Yesterday was a Wednesday and I wasn't volunteering with the refugees as it's half term so I treated myself to a carboot outing. I bought a few things all for 50p or less. There are four in this drawing. I used a little lighting as it's another overcast day. 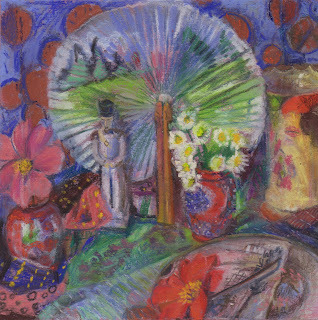 The frame (Mick Kirkbride) helped me to organise the space but in the drawing and redrawing (Peter Clossick) I moved the fan a bit and it took absolute centre stage, which wasn't what I intended when I began. 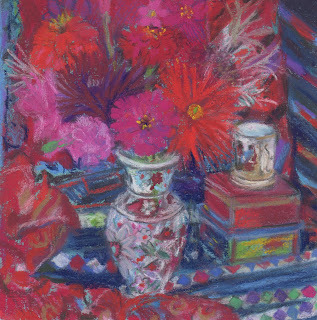 What I liked about the still life as I composed it, was the subtle repetition of form and colour and the way the white in the feverfew became the brightest spot in the drawing. This drawing took me a long time but it was fun as there were many complex patterened spaces that were fun to work through. I chose 14 colours and two whites and didn't need to find any more asfter I'd started. Because it's a small drawing and I wanted some detail I did need my pastel pencils in places. when it got too fiddly, I got my eraser out and removed the fiddle. 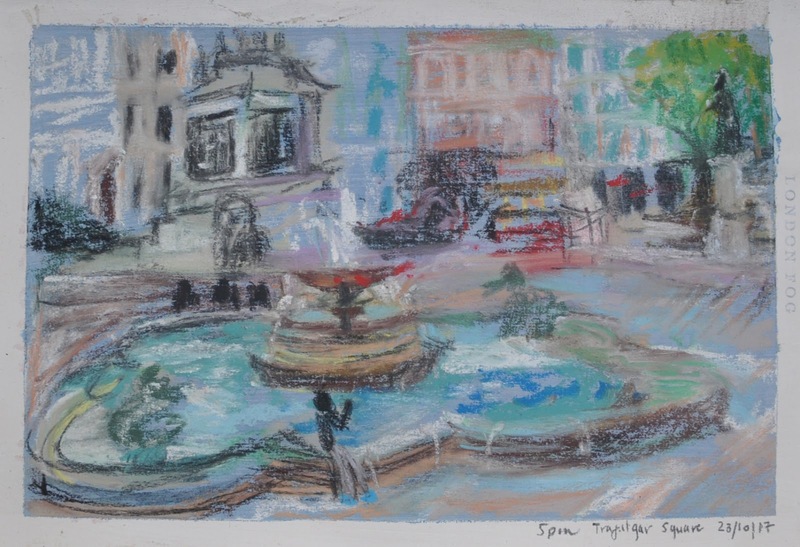 5pm Trafalgar Square, pastel on altered book page. What with birthdays, anniversaries, and family visits, this week has been a case of snatching drawing time where I've been able to. 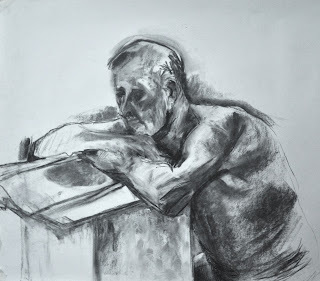 Yesterday was a Monday NEAC drawing day. 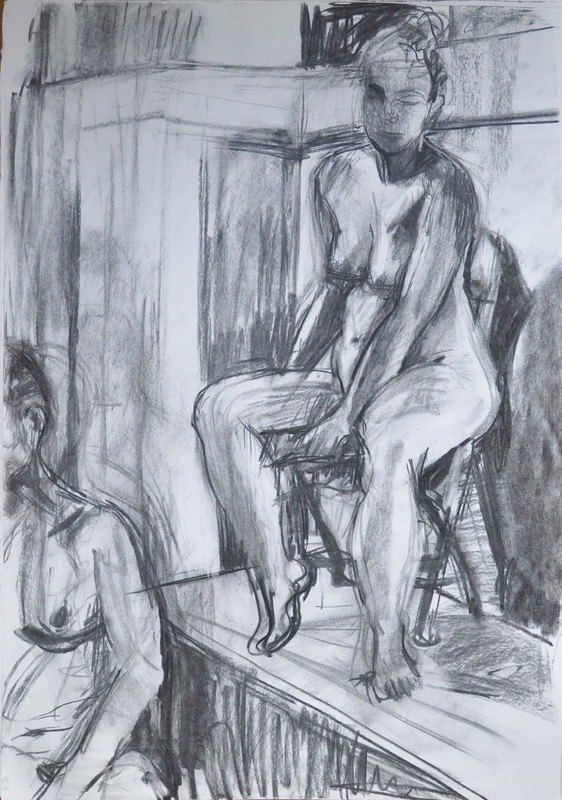 I hadn't arranged any studio visits so I left later and had a few hours before drawing began to visit the National Portrait, to find Great Art in a wander around Shoreditch and to do a 40 minute sketch in The London Silent Traveller in London sketchbook, that I hope to fill up before the end of my NEAC term. Peter Clossick has been the tutor at Life drawing for the past two sessions as Mick is away with his family drawing for a week. 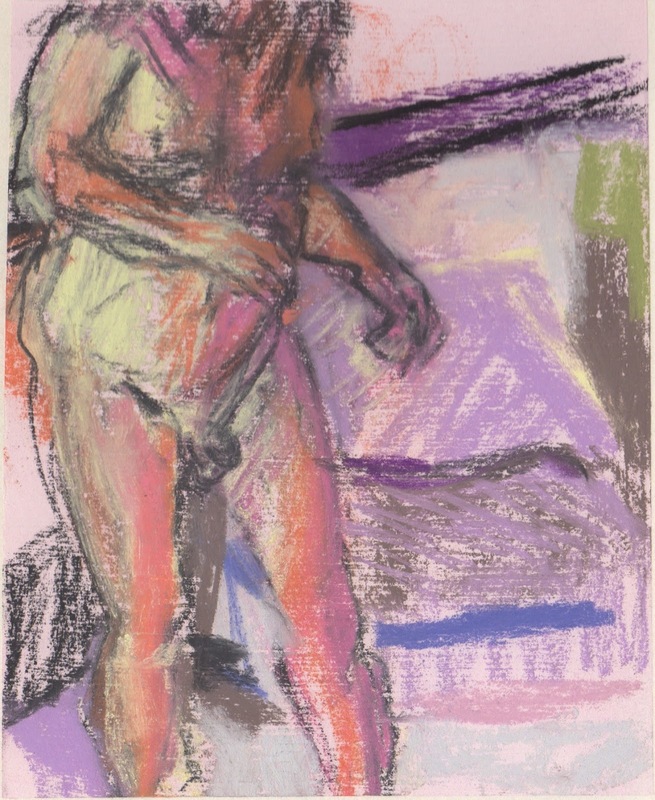 Peter helped me to think differently about my process and although the resulting drawings are certainly mine in feeling, while I was doing it, It felt alien and challenging and the struggle enlived the process. Today's job was to build on some of the things I have learned so far on my NEAC year and to make something that could be construed as meeting the brief for 'inheritance', an juried exhibition at Norwich Castle Museum with a deadline at the end of the month. I began by asking myself what exactly I have inherited from my mother. 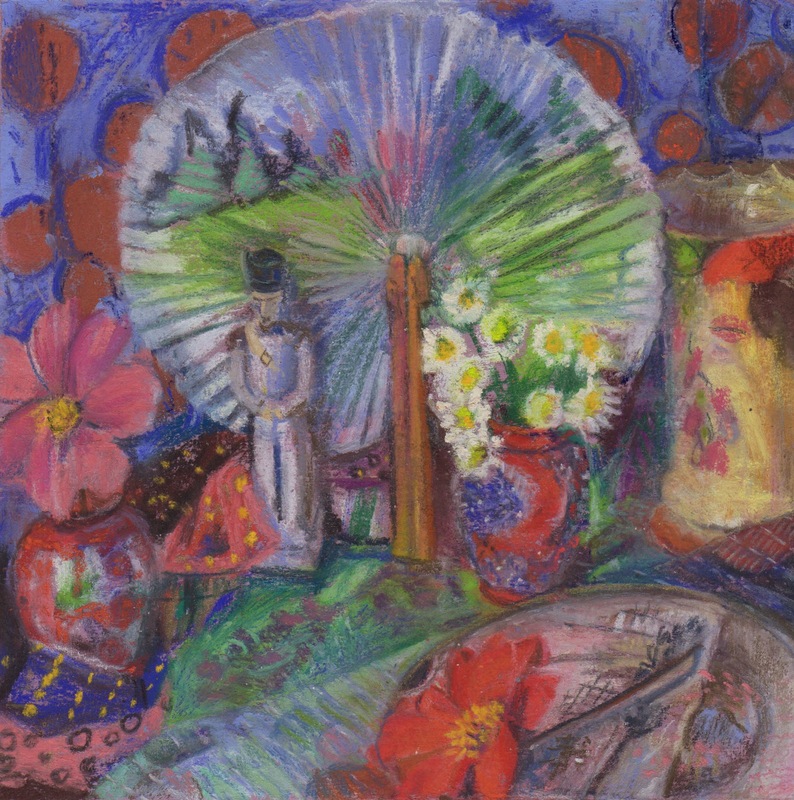 These are the relevant things that I came up with: a love of flowers, a love of colour, a love of making things, a love of collecting things and a love of other cultures. With that in mind, I gathered objects. The central picture is a photo of me when I was young that my mother gifted to me, from her collection. While visiting Mick Kirkbride in his studio last week, I talked about how I am trying to internalise all that he says and all that I have discovered so far. 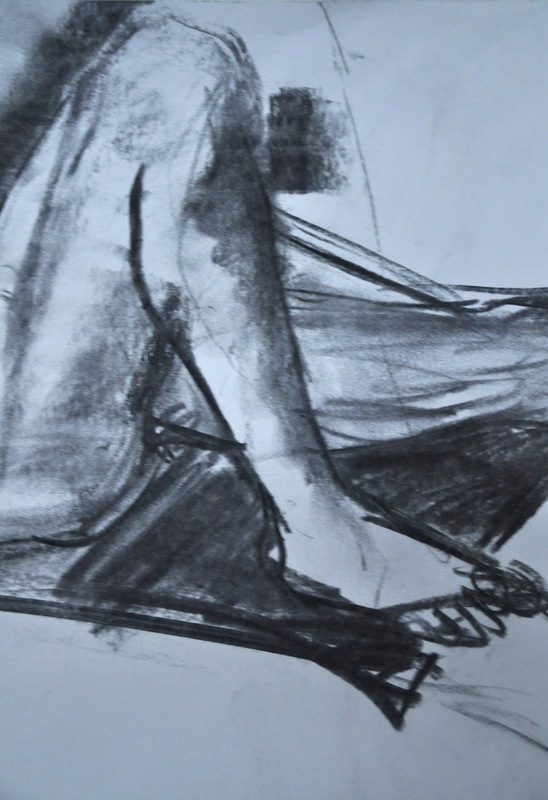 Last week at life drawing class I finally understood about how a ruler and a window can help me - that the angles and the position don't lie. I began by framing my subject by holding up a cardboard window and checking the height, checking the angles with that and a ruler. Wow, it was much easier to understand the space. 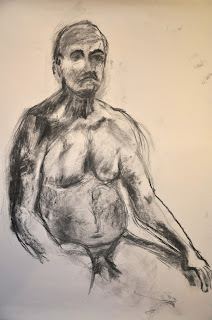 I used Melissa's approach of composing the picture with charcoal (in places). I kept checking with the rule and the mount. Another thing Mick talked about last week was the focus, bringing it in and out of focus to direct the eye. 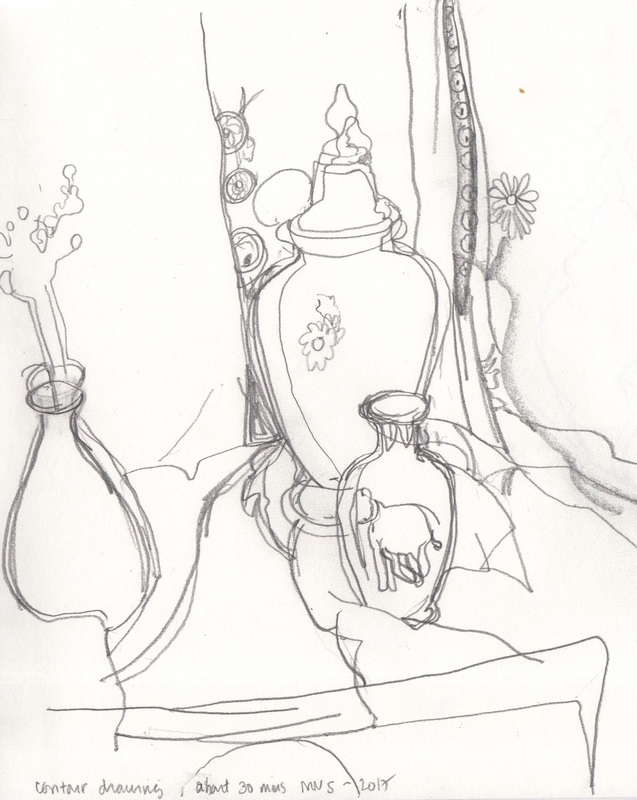 Of course I think about this and make choices every time I draw, but today I experimented actively with it. Another thing I've been meaning to do but until now havent…I wrote some things down in my day book! 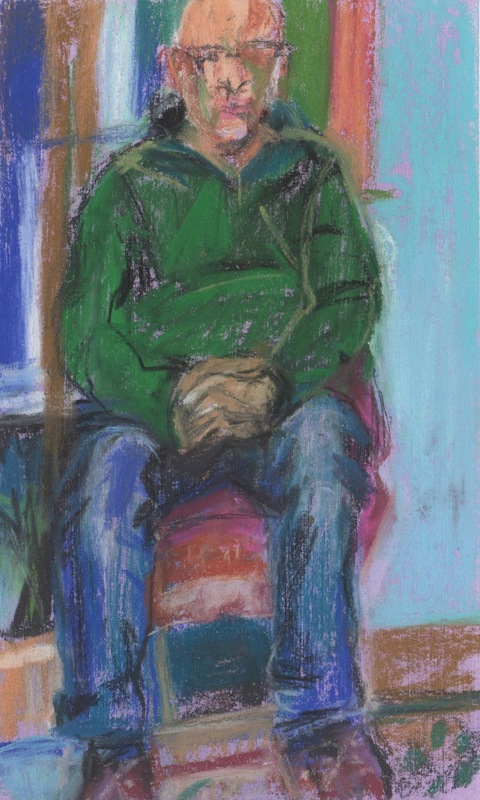 I chose 32 pastels and I used most of them. As the garden wanes I've noticed that the remaining flowers tend towards the vibrant reds. So in October I find myself with dramatic arrangements that look forward to December and all that. For me, reds and pinks and fuchsias are colours I love to explore. One year when I was in school I only wore reds for the whole month of December. Some people think putting all those related colours together creates a clash. As I assembled the objects, including the harlequin stripes, I just felt excited. The drawing has been stop and start all week and bringing it to a conclusion has proved more difficult than anticipated. 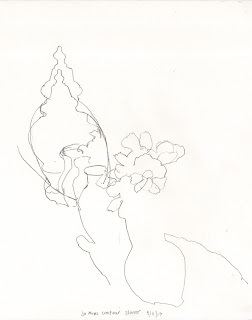 Luckily, I concentrated on the flowers in the first instance as the flowers as they are now are rather sorry. Every summer we spend time in the beautiful Suffolk Meadow we are 'babysitting' for as long as we can. Earlier in the summer on one evening I did a little drawing and took a few photos to help me remember the space for later, when it would change beyond recognition and would be too cold for sitting in. We were hoping for the owls to come out on this particular evening but, alas, we didn't see them. 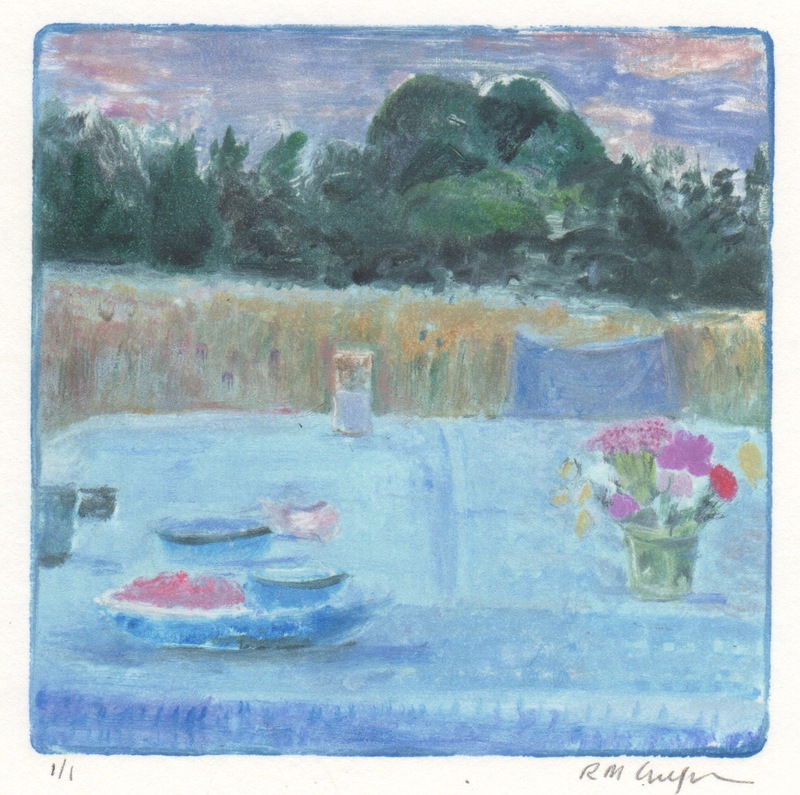 Still, what could be better than a picnic in the field with a view of the ancient hedge, flowers from the garden and a tall glass of something delicious. Patrick thinks I should use this one as my replacement for the mini print. What do you think?